You love a good cup of coffee from a French Press, but some mornings you don’t have time for it. Good news for you! You can satisfy your French Press craving with a travel mug instead. 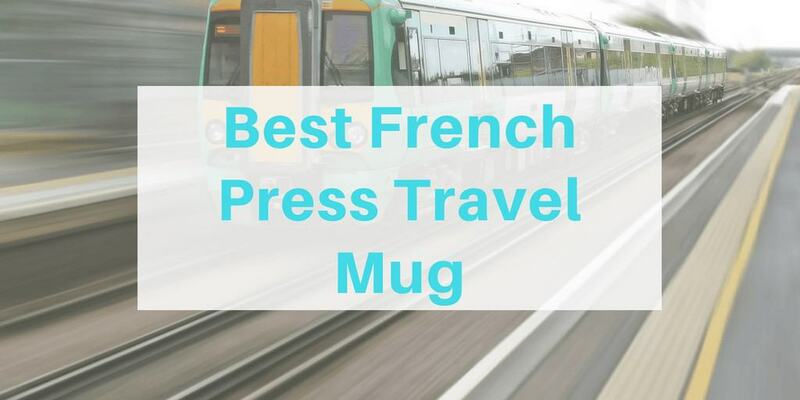 We’ve put together a list of our top picks for best French Press travel mug to get you started. Let’s look. Our first travel press is from Bodum, a well-known maker of coffee paraphernalia. Their mug is a 15-ounce stainless steel design. It is vacuum sealed and double walled to keep in heat and maintain optimum temperature for several hours. The lid is spill resistant, and the plunger is built right into the top. Add coarse coffee grounds or tea leaves and hot water. Allow it to steep a few minutes before depressing the plunger and getting on your way. There’s a wide, slip-resistant grip around the middle to help you hold on, but the design doesn’t fit your hand ergonomically. It’s narrow enough to fit comfortably, but we’d like to see some kind of depression in the middle to fit your hand better. Nevertheless, it’s a durable option for a travel mug. The top is a thick plastic that should hold up through many uses, and stainless steel is tough to break. It’s completely dishwasher safe. Just disassemble the pieces for thorough cleaning. The Kohipress is a full immersion steeper. It contains two pieces, one for your coffee grounds and another inner chamber for the press itself. Add grounds and coffee to the outer chamber. When you insert the inner chamber, it depresses the grounds and creates a doubled walled mug that keeps coffee warm. The press is pressurized, similar to the Aeropress, and uses a very fine micron filter, so you shouldn’t get any grounds. It holds 12 ounces, and the top is leakproof. The outer pieces are industrial grade stainless steel, which is highly durable, and the plunger is food grade plastic. You should get many uses out of your travel press without worrying about things breaking. It produces an excellent taste, but it would be better if it could brew just a little more than 12 ounces. If you only drink one standard size cup a day, it might be enough for you, but we’d prefer a bigger sized press. There’s no grip around the outside to help you hold on to it, but it is narrow enough to fit into most hands well. 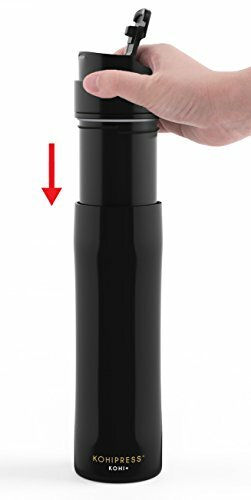 The Espro is a stainless steel travel mug coated in matte black. The filter itself is a double-walled design to reduce the amount of grit that makes it into your final cup of coffee. It helps to stop extraction so that when you’re finished steeping, the taste of the coffee doesn’t change from the first sip to the last. 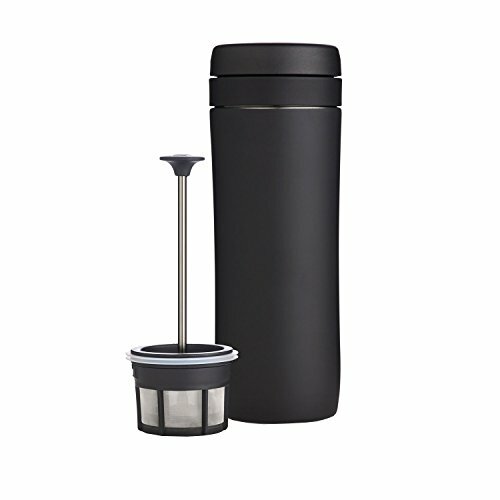 The double walled design keeps coffee warm for several hours. 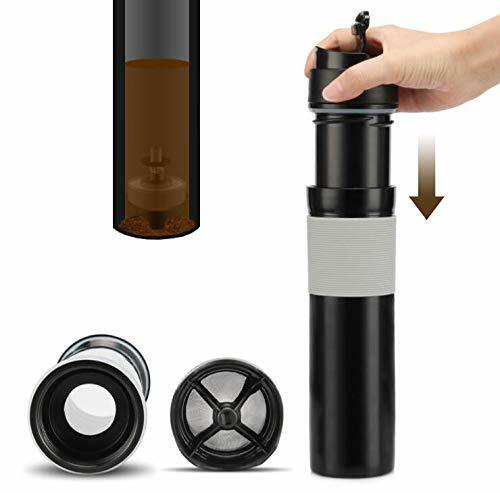 You can use it as a travel press and make ten ounces of coffee, or you can remove the press component and hold 15 ounces of already-brewed coffee. We wish it made a little more in the press, but it should give you enough to get to where you’re going. One interesting aspect of this mug is it uses a paper filter in between two press filters. The paper absorbs the oils from the extraction process, so you get a cleaner tasting coffee. If you prefer the oilier feel of the traditional french press, you can leave the filter out. It’s not as ergonomic as some of the others on the list, but it’s durable and should produce a cleaner tasting coffee. Amovee’s press is similar to the Kohipress, but it’s a lightweight, food-grade plastic with silicon grips around the middle. The plunger is pressurized and removes almost all of the sediment from your cup. It doesn’t stop extraction once the plunger is depressed, so this type of bottle is best if you plan to drink your coffee right away (or if you like a particularly strong cup of coffee). The pieces disassemble for cleaning. It makes about 12 ounces of coffee, which is an average sized coffee mug. We like that it has a silicone grip on it. Food grade plastic is BPA free and split resistant, especially at the lid. Even though it’s plastic, it still keeps your coffee warm for several hours, and you won’t feel the heat as much because of the grip. the all-plastic design might be a turn off for some. 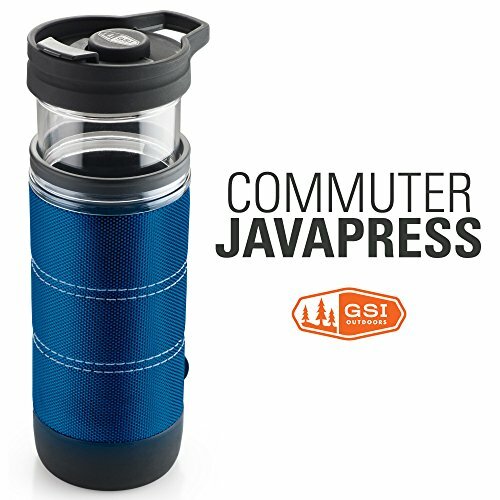 GSI’s 15-ounce mug uses two sliding carafes to replace the plunger in their French press design. The double carafe creates a double-walled design that helps keep your coffee warm for hours. There’s a no-slip bottom, and the entire wall is covered in a fabric sleeve that’s easy to grip and prevents heat from reaching your hands. The carafes are durable BPA free plastic. The sleeve is made of a material called copolyester, a synthetic material that resists tearing. The design makes it easier to add cream and sugar after extraction because there’s no middle plunger making things difficult. Remove the cap for access to the inner chamber without disturbing the grounds. It has a tendency to spill if you don’t depress the inner carafe evenly. If coffee leaks between the two carafes, it has a tendency to spill. Take care to use this on an even flat surface and go slow. Otherwise, you’ll get a spill. double carafe design gives you easier access for cream and sugar. 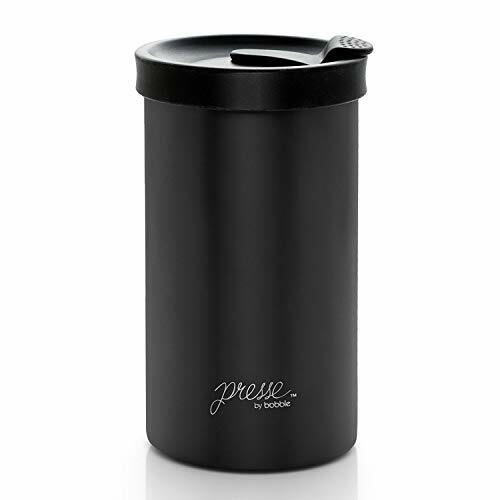 Presse uses a unique three-wall design to keep your coffee warm for hours. The inner carafe is the plunger, so you have easy access for adding cream and sugar without disturbing the coffee grounds. It uses food grade stainless steel and high-temperature silicon to protect your hands and improve grip. It holds about 13 ounces of coffee, and the design resembles a coffee house to-go cup. It’s entirely dishwasher safe. Just disassemble and clean. 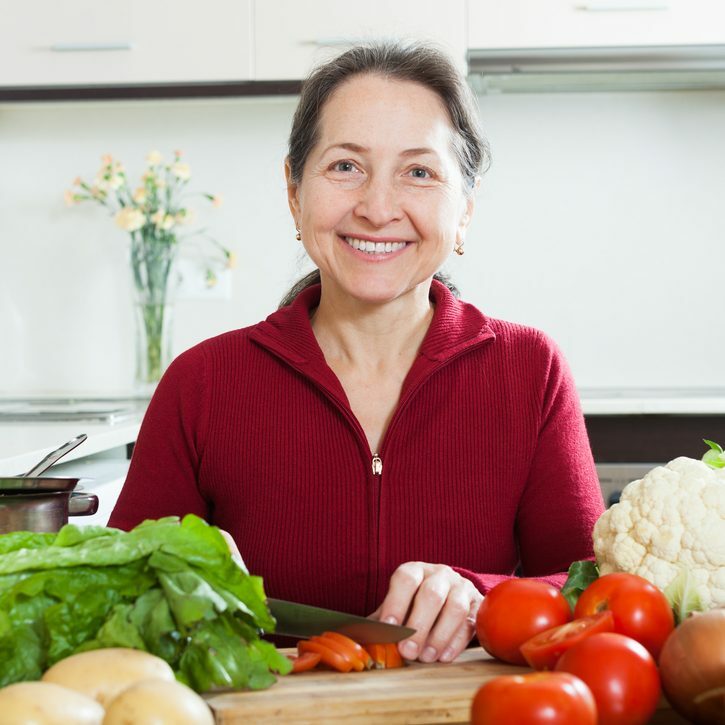 The lid is prone to spilling if you happen to grab it by the lid edges and it may have a slight rubber odor. If you remove your lid completely to drink, it should be fine. Those of you who like to drink your coffee en route may have trouble with the smell. It’s also a little wide, so it might not fit in some of your cupholders in your car. Be sure to measure before you buy (3 1/8 inches across). Our final design is a mug with a handle and a much thinner bottom explicitly designed for most cupholders. It comes with two different lids, one a plunger and one a standard sip top lid. It’s made of stainless steel with a high gloss black finish that resists scratches. The plunger is an ultra-fine mesh screen that should keep most grit out of your cup. You’ll need to add cream and sugar before depressing the plunger, or you’ll disturb the grounds. One unique benefit is that it has a storage container at the bottom for dry grounds or tea. You’ll always have enough for a second cup if you need a refill during the day. The handle attachment is made of aluminum, so it may not last as long as the carafe itself. Also, if you don’t travel in your car, the thin bottom can make the entire mug top heavy. It works great with the cupholder to steady it, but for a simple carry mug, it might not be the most ergonomic for you. 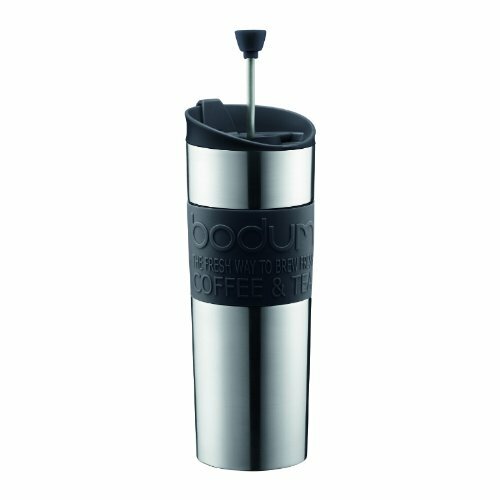 Bodum just knows coffee and it's our pick for best French Press travel mug. We love that this press has everything we wanted on our list. 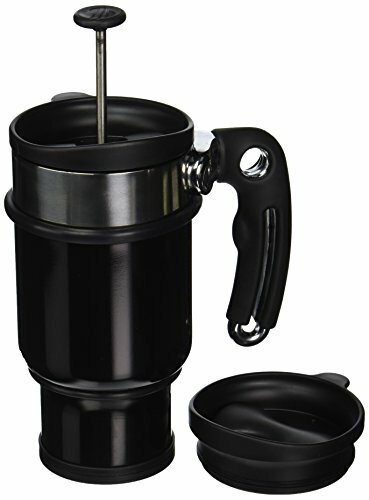 It keeps coffee warm for hours, is easy to use, and fits in most standard cupholders without being top heavy for those of you who travel without a car. The design is simple, but the mug should last you a long time. Plus, the silicone grip is perfect for holding on in a variety of situations. Travel French Presses can help you get your coffee fix without being late. We love that we can enjoy a well-made cup of coffee on the go and we think you’ll be delighted with any of our top picks but especially our winner. Happy brewing!